Laticastelli, a country Hotel Relais with poll near Siena, has published a special offer in half board for the Easter weekend. This special offer is valid throughout the month of April for those travelling to Tuscany after the Easter holiday. SIENA, Italy - March 24, 2017 - PRLog -- Hotel Relais Laticastelli in Tuscany has published a new special offer for the Easter Holidays 2017. 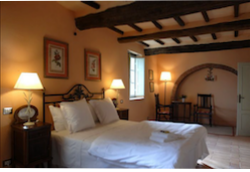 Hotel Relais Laticastelli is an albergo diffuso near Siena in a quiet location called Armaiolo at Rapoano Terme. The Albergo Diffuso is an innovative concept of hospitality, launched in Italy in the early 1980s as a means of reviving small, historic Italian villages and town centres off the usual tourist track. Laticastelli is just that: a medieval hamlet brought back to ancient splendor after years of careful work. Today Laticastelli is the ideal hotel in tuscany with pool, for those seeking quiet quality accomodation and are travelling by car - a retreat away from the noise and confusion of Siena and other famous locations which attract many tourists, a place where Guests relax along side the outdoor swimming pool with a panoramic view or at the restaurant tables in the shade, after a long day out sightseeing or playing golf at one of the many nearby golf courses. "We are very excited about opening up for spring and summer"
"It's a great pleasure for me to announce that Laticastelli is about to open after the long winter. We welcome you to spend your Easter vacation at Laticastelli, starting April 3rd. Here at Laticastelli we have prepared an incredible offer valid throughout April, aimed particularly at the Easter holidays. April in Tuscany is a special offer that comes with many possible variations to host families and couples wanting to visit Siena and surroundings. Hotel Relais Laticastelli is the perfect place to spend your Easter holidays in total tranquility and relaxation, away from noise, pollution, and confusion. The Crete Senesi's beautiful scenery is perfect for a nice long walk or, if you prefer, a bike ride in the refreshing Tuscan spring air. This is what makes Laticastelli is the ideal place for your vacation in Tuscany, a vacation in an area of historic and cultural relevance but at the same time in close contact with nature. Laticastelli offers a stay in one of our charmingly decorated rooms (for families and groups; apartments may be organized on request). Our half-board option offers Guests the opportunity to organize excursions and other fun and relaxing activities during the day and relax here at Laticastelli at the end of the day with a three course dinner freshly prepared in our restaurant La Taverna Toscana with beverages included."